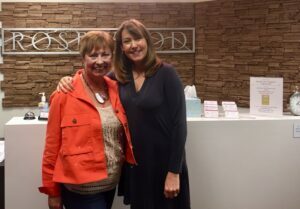 After speaking at Rosewood Outpatient (thanks Dena Cabrera!) in Tempe, AZ with staff and parents about including parents in treatment and having shift happen, I’m back in California…now in the Central Coast Region. We’ve always heard it’s fun to drive the entire coast from South to North…so since it won’t stop snowing in Minnesota…we’re doing it. Actually, since we’ve already driven most of the parts from LA south, we started just north of LA yesterday and we’ll be in Seattle for St. Patty’s with our youngest. 3 powerful resources to help you become a calm, compassionate, confident caregiver. A Physical Copy of Just Tell Her To Stop: Family Stories of Eating Disorders. Link to 10 Videos – 10 essential, specific, powerful tools for coping. PDF Guidebook – deepen learning on the 10 essential, specific, powerful tools for coping by writing plans to take action and move forward. 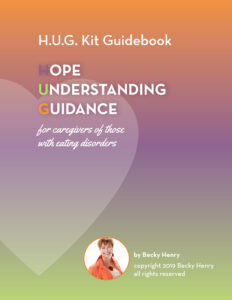 ​Each week I’ll share some tips from each of these 10 Topics covered in the HUG Kits. Today it is “Emotions” that come up as a family caregiver. 1. Notice the emotions you’re feeling right now. It will help you tolerate your emotions by simply noticing them without judgment. 3. Ask yourself, is this emotion serving me and my loved ones? Seeing families suffering in isolation grabbed my imagination so much that I wanted to get these tools in as many people’s hands as possible. It’s not possible for everyone to do 1:1 coaching with me so I imagined and created a simple, cost effective way to get these antidotes into family caregiver’s lives and created the HUG Kits. Be safe out there, this winter is proving to be a wild and wooly one everywhere.